When we first saw this beautiful property we knew it was the one for us. Situated just 20 minutes from the theme parks it is ideal for our family holidays. Set in the stunning development of High Grove just minutes from restaurants and shops what more could we want. Our beautiful (second home) is well maintained to the highest standard, the luxurious Executive villa enjoys a spacious 2698 sq ft of fully air conditioned bright and airy living space. It is totally equipped and furnished to an extremely high standard with your comfort in mind. It has a lovely bright, spacious and airy feel to it with all the space you need for a fun filled and relaxing holiday. High Grove offers excellent community facilities which include a Clubhouse/Reception/Pool where you will find gym equipment in the Fitness Room, Games Room, internet access, TV room with football and pool table, where you can relax with tea or coffee, a large communal swimming pool with hot spa, sun loungers and patio furniture and a children's play area close by - all of which are available to use when you are our guests. Our villa 'Florida Star' is situated on one of the prime plots on High Grove and overlooks a beautiful green communal area. We are sure you will love it here as much as we do. Outside: Our inviting 14ft x 26ft private pool (with optional pool heating) has a fully paved deck area and looks out over a lovely large community green, which offers stunning views and benefits from extra privacy. The pool area is fully enclosed by a fine mesh lanai that lets the sun in but keeps unwanted insects out. The pool has underwater and outside lighting for when you fancy a swim in the evening. The patio area is fully equipped with a large table and six chairs and four comfortable sun loungers and various large plants. Perfect for when you want a relaxing day away from the theme parks. Utility Room: The Utility Room consists of a large top loading washing machine, large tumble dryer, iron, ironing board, two clothes airers, linen basket and vacuum cleaner. We also have a separate bathroom downstairs adjacent to the utility room for your convenience. All linen and towels are provided for your use however we do ask guests not to use these outside as there other provided. Bathroom 1 - En-suite bathroom to Master Bed 1 with large oval bath, huge walk-in shower, double sinks and vanity units with large mirror over, large linen cupboard and separate WC. Bathrooms 2 & 3 - Family bathrooms with bath/shower over, basin and vanity unit and WC. Fully fitted kitchen with crockery, cutlery, pots, pans and other utensils. Also Melamine crockery for outside dining. Special interest holidays: All Disney theme parks are just a short drive away as are Universal Studios, Islands of Adventure and Seaworld. (Animal Kingdom is the closest park to us - approx 20 minutes drive/6 miles). Beautiful beaches such as Cocoa Beach, Clearwater and St. Petersburg, Daytona are between 45 - 90 minutes away. Large shopping outlets are also just a 20 minute drive away. Coast/Beach: Cocoa Beach (East coast) - 75 minutes (approx) Daytona Beach (East coast) - 80 minutes (approx) Clearwater (West coast) - 90 minutes (approx) St Petersburg (West coast) - 90 minutes (approx) Travel: Orlando International Airport is a 35/40 minute (approx) drive. Sanford Airport is approx 60 minute (approx) drive. Car hire is a necessity. Distances: Disney main gate - 10-15 minutes. Animal Kingdom - 10-15 minutes. Sea World - 25 minutes. Universal Studios/Islands of Adventure - 30 minutes. Busch Gardens - 55 minutes. Kennedy Space Center - 60 minutes. Legoland - 40 minutes. The house has everything you need! It is set up in a way that gives you incredible room for a large group. We were going to be 10 but at the last minute we were 8 ... there was a lot of space! The pool was cold when we first got there but I called the number given me and it was taken care of ASAP. I hope we get the opportunity to use this property again in the future! We have stayed at this villa many times in the past but it's the first time under the new owners. The new decor is stunning and comfortable. The kitchen is fully equiped and both sitting areas are perfect for putting your feet up after a tiring day at the parks. The bedrooms are spaceous and with two bathrooms and an en suite there's no arguing over the time people take in the morning. There are alarms on the doors leading to the pool which is a safety feature for children and a lovely relaxing feel to the pool area. We prefer to only take a few clothes so use the laundry room, this means more room in the suitcases for all the shopping we do in the outlet mall's. The villa is in easy reach of all the main theme parks, restaurants and shops, with a large Wal-Mart only minutes away. Just outside The complex is an Irish pub which does good food. The journey from both the Orlando airports is straightforward and not too much of a distance away. We love staying here and are already planning our next visit. Booking the villa was uneventful and Fiona replied to our emails quickly and was very helpful with any questions we had. Whether you are a small or large group you will not be disappointed. We could not recommend this villa highly enough. Huge villa, lovely pool and large games room. Perfect location. We had a great time at this villa, we love the area, it’s the perfect location, lots of restaurants nearby, a supermarket along the road and an easy drive to the parks. The villa is a great size,immaculate and modern. The owner Fiona was very helpful and we would absolutely return for future visits. Beautiful Home - Nice Pool - Great Location!!! Thanks to the owners of this wonderful home in a beautiful neighborhood. We had a great Vacation here. The community pool and club house was very nice as well. We never knew that Clermont was such a Jewel! We loved it! The house was clean and very comfortable for our group. We definitely hope to book this same house again next year. Our 2 week stay in Florida was made even more amazing with our stay in Florida Star. We have stayed in this house in previous years, before Fiona became the new owner and refurbished the whole house and she has done a fantastic job at it. Staying here was cozy, and there was everything you needed, it felt like home away from home, which is great after a long day at the theme parks. The house is a great size with a great pool which with pool heating was super warm, also helped by having a pool cover, which is one of our biggest requirements when choosing a house. 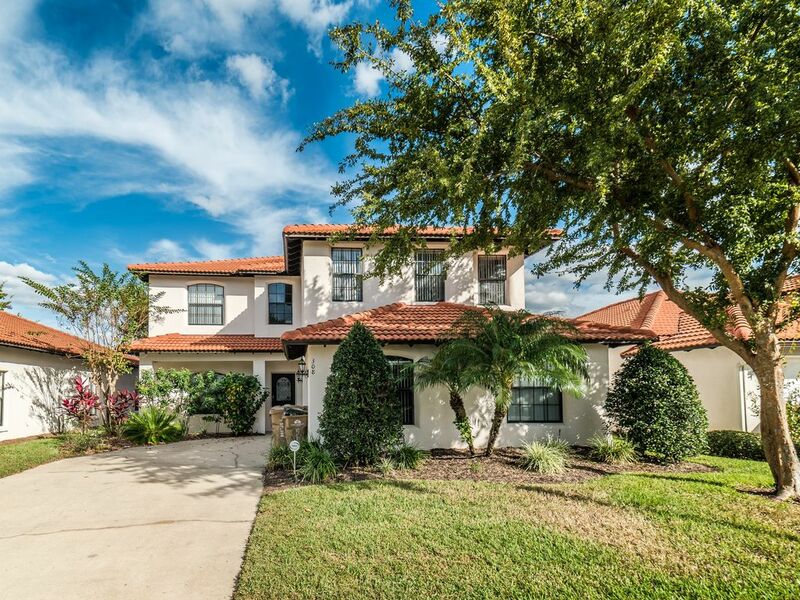 It is in a beautiful neighbourhood on a gated community and it is in a great location. Fiona was fantastic, replied promptly to any questions we asked her and we did not need to contact the management company during our stay. Will definitely be staying here again, and we are already looking forward to it.